I recently sat down with eCommerce leaders from Celigo and BVAccel for the webinar "Maximizing Online Returns Conversions". In the webinar, we share tips, best practices, and real-world examples to help brands use the online returns experience to drive revenue and build brand loyalty. If you missed the webinar, not to worry. We have published the recording here and I have recapped the discussion in today’s post. Why do I need a solution to manage my returns? Before we jump into the ways that merchants can use returns to drive new revenue, I think it's important to start at the beginning. Why do you need a solution to manage returns? After all, there’s already a host of expenses that come with running an online retail store and product returns often falls at the top of that list. Because most returns result in lost sales and unhappy shoppers, but there is a lot to be gained from paying attention to the post-purchase side of your business. In fact, 67% of shoppers check the returns page before making an online purchase, and 92% of consumers report they will buy again from an online retailer if returns are easy. Not surprisingly, many early-stage retailers choose to handle returns manually in-house. This can take a significant amount of time and effort for your team on a daily basis. If this is the preferred path for your business, I recommend taking the time early on to optimize your product imagery, messaging and size guides to help lower overall return rates. This blog post by Shopify Plus has outlined four ways to better predict consumer behavior and reduce the overall volume of returns. The other option is to add a dedicated returns management platform. What are the advantages of a dedicated returns platform? Having an online returns platform provides a great opportunity to bring eyeballs back to the site. It also significantly reduces support contact costs. A good returns management platform will also help you uncover loads of returns data which can be used to improve merchandising, product marketing and overall business decisions. Aside from the internal benefits, having a returns platform makes the experience easier for your online shoppers. Oddly enough, even if a product is being returned, having a great return or exchange experience creates organic buzz and positive referrals. Having a poor experience can have a negative impact on shopper retention and growth. Can I use a returns platform to drive new revenue? Often referred to as a 'necessary evil' or the 'cost of doing business', returns get a bad rap, but they don’t have to be a margin crusher for your business. In fact, having a returns platform is going to increase first-time shoppers and can help recoup previously lost revenue. At Returnly, we help retailers win-back sales by providing instant refunds and exchanges at the start of the return process before shoppers have sent back their original items. These temporary credits massively increase repurchase rates, allowing online brands to make very significant improvements to their bottom line. Returnly takes on the return and customer risk to make this possible. The online clothing store, Ivory Ella, implemented this technology and has seen incredible results. 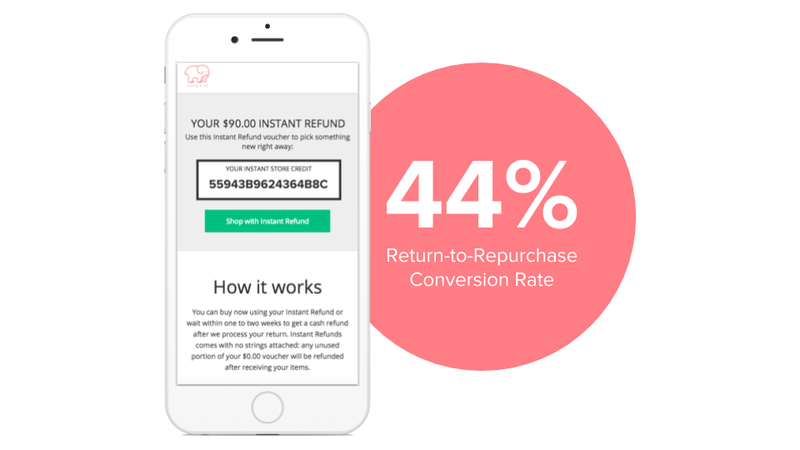 With both instant online refunds and exchanges enabled, they are seeing a 44% return-to-repurchase conversion rate and a 130% return-to-repurchase uplift. This new revenue is directly attributable ROI positively affecting their bottom line and doesn’t take into consideration the long-term positive impact that this experience can have for the brand. Another way to increase revenue through returns is to re-examine your returns policy. It may feel counterintuitive, but a customer-centric returns policy can encourage new sales and lower return rates. A research study by UT Dallas found that the longer a consumer has a product in their possession, the more attached to it they become and less likely they are to return it. If free returns are offered, sales can increase as much as 357%. Below is an example of Nordstrom’s returns policy, which does a great job of using the returns policy as an opportunity to show customer appreciation, encourage trust, and build loyalty with their online shoppers. As online shoppers have grown savvier, expectations have increased. Shoppers expect faster, easier, and free returns for their online purchases but returns don't have to be a loss to your bottom line. By providing a lenient return policy and an easy way to buy again, brands can turn lost previously lost sales into repurchases and one-time returners into hyper-loyal shoppers. Deanna Hammond is an Account Executive at Returnly, where she works with retailers to drive positive post-purchase experiences and outcomes for their business model.